Make your own Biff preserves! You can download Biff’s face and print it out to make your very own jar of Biff. The full size print is good for something like a spaghetti sauce jar. I had to print mine at 60% to fit my small preserves jar. Send me a picture of your Biff preserves or post one in the forum. I guess it was one from one of the days he didnt blow up or get torn apart. “Biff in a Jar: for Biff on the go.” Heh, now thats an interesting feat… did he manage to stuff his whole body in there, or just his face? Hmm… That mood doesn’t look particularly good, but then, it is Biff. OH, y’know what? I won’t be carving pumpkins until Friday Evening, so I may well use the Biffface to as a stencil for my pumpkin; should that happen, I’ll totally post picatures on the forum. Chris I have an idea for your short description: one panelled disasters five days a week! I so wish I had a jar. Hell, a lot of jars. I’d put Biff-in-jar all over the place. Here’s a quick question, how is Biff going to get out of there? Biff or not, he had to have thought of that before he did this amazing if bewildering feat. Can emotions go stale? 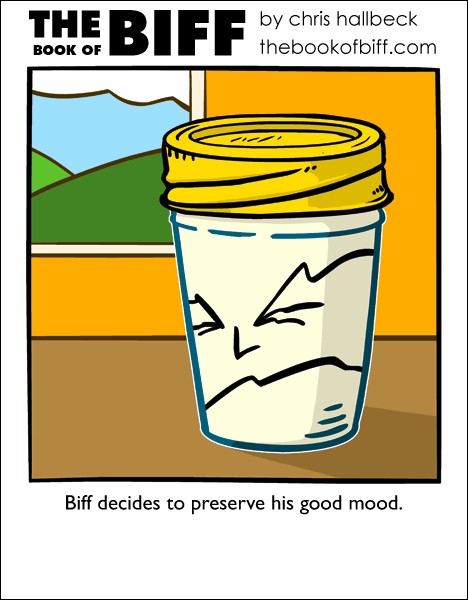 Biff hadbetter use his good mood before it’s wasted. If I could bottle up emotions (more than I already do), I’d preserve some pure, unadulterated rage. I’d keep it in my weapons closet for emergencies or whenever I feel a pressing need to go berserk. If that’s his GOOD mood, I don’t know if i wanna know him in a bad mood! Keep the good work Chris! sell well, alongside the Canned Farts. How much does a jar of Biff cost??? Hmmmm, Biff is being more conservative now! He used to just grab a spare head (http://thebookofbiff.com/2007/06/15/269-stress/), but now he can litteraly conserve HIS natural resources! You: Someone set up us the jar! Me: All your Biff are belong to us! You know, seeing the picture of the preserves for some reason made me think… we have NO idea what you look like, Chris! I think his good mood is spoiling! Biff will catch that jelly thief.